Lead tree | Infonet Biovision Home. Common names: Luo: Lusina; Swahili: Lusina. It was widely introduced in the tropics over the last 100 years, reaching Africa in 1950. It is naturalized and to some extent invasive in some parts of Kenya with moist ground and warm climate. The species exhibits great variation. The chemical mimosine in the leaves can cause hair loss, infertility and stomach problems in livestock, especially non-ruminants like donkeys. Livestock feed should not therefore contain more than 20% of Leucaena. It grows well at altitudes of 0-1,600 m, in full sunlight and in well drained neutral or calcareous soil. It does not tolerate acidic soils and needs more than 600 mm rainfall. It does well in agro-ecological zones II-V. It may be propagated by use of seedlings and direct sowing at site. Is very fast growing on suitable sites; pollarding, lopping and coppicing may be employed. High plant densities are recommended for solid fodder. Fodder yields range from 40 to 80 t/ha when moisture is not limiting. Food: Pods, seeds and leaf tips have been used as food, although mimosine toxicity makes this practice risky. Fodder: is one of the high quality and most palatable fodder trees of the tropics being equaled to the "alfalfa of the tropics". Apiculture: is in bloom almost throughout the year, providing constant forage to honey bees. Erosion control: An aggressive taproot system helps in reducing the run-off. Shade or shelter: is often is used as a shade tree for cocoa, coffee and tea; it generally acts as a shelterbelt, providing shade and wind protection for a variety of crops, especially during early growth. Reclamation: L. leucocephala thrives on steep slopes and in marginal areas with extended dry seasons, making it a prime candidate for restoring forest cover, watersheds and grasslands. Nitrogen fixing: It has high nitrogen-fixing potential due to its abundant root nodulation. Ornamental: it is suitable as an ornamental and roadside landscaping tree species. Boundary or barrier or support: it is used as a live fence, firebreak and live support for vines such as pepper, coffee and cocoa, vanilla, yam and passion fruit. Intercropping: is one of the most widely used species in alley cropping, where it is planted in hedges along contours with crops in between. A psyllid insect pest, Heteropsylla cubana, causes defoliation. 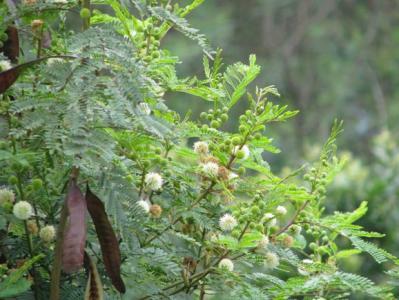 In Kenya, the psyllid defoliates the leucaena, resulting in severely reduced production of fodder as well as wood, but without killing the leucaena but it has caused serious defoliation and mortality in eastern Africa. A Caribbean parasitoid, Psyllaephagus, shows specificity and excellent appetite for H. cubana and hence offers possibilities for biological control. Some varieties of lusina are susceptible to gummosis, most likely caused by Fusarium semitectum. Ganoderma lucidum is said to cause root rot in arid and semi-arid regions and Leaf-spot fungus can cause defoliation under wet conditions. Wild animals avidly consume seedlings.